In Asia we can find multitude of exotic dishes, meals of rare and unusual recipes. And in Asian, Vietnam is crowned as the superpower of culinary. These cuisines can be strange, terrified, but they are part of a long history of culture and culinary. You may shock when you hear about these, so don’t ask, just eat! A very strange combination of frozen pig blood, cartilage, tail, meat, and the pig’s organs such as heart, stomach, liver, and guts terrifies not only the foreigners but also the people who visit the Northern west Mountains region. The dish is served with banana flowers and mint leaves. 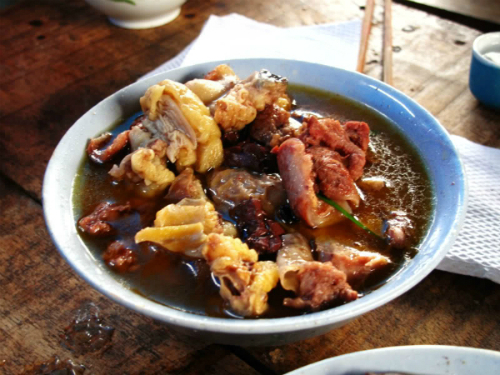 Not so many dare to try this, but this dish is a part of the exotic and curious culinary map of Vietnam. Farm rats are popular in rural Vietnam. These rats eat rice in the field and are believed to be clean and not contaminated with diseases. In the rice-farming Delta, rats are the scourge of crops — but they’re also a popular source of protein in many rural areas. Moreover, they are also thought to have medicinal properties. This type cuisine is indispensable in the rice-farming Delta, and it is so good to be missed. 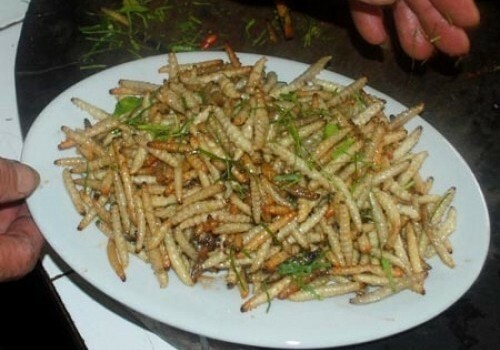 Another cuisine that you should not miss even though it can be shock for some people when they see the larva is still alive and moving in your dish. If you can surpass the fear, it will be the dish you cannot forget both in flavor and visual. 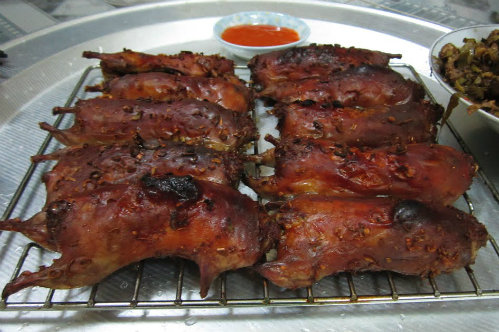 With its rich flavor and the fatness, Đuông is favored by diners in many regions of the country, especially in the Mekong Delta. There are many ways to cook this exotic dish, including grilled, fried, steamed with lime leaves, but the best is to dip them in fish sauce. A common reptile, which living in Binh Thuan desert’s sand dunes, is favored by many Vietnamese. This cuisine is extremely flavorful and nutrient. 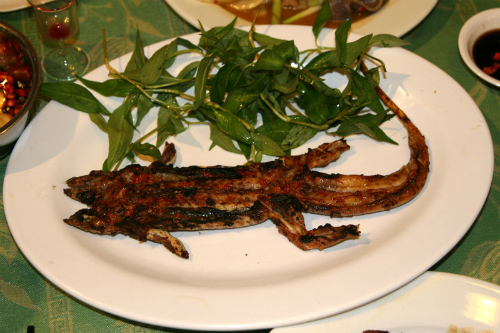 The locals usually steam iguana with tamarind, grill with salt, or stew with Chinese special medicine herbs. 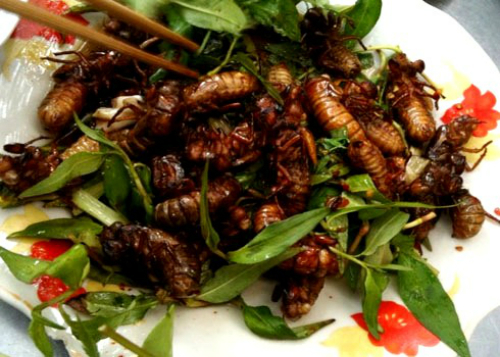 The main purpose of insects and reptiles in Vietnam is to soaked them in medicine alcohol. However, the desire for more exotic flavors and cuisines has changed the uses of these animals. Unlike the iguana, the scorpion’s main dishes are grilled and fried. Whether you choose to fried them with red peppers, grilled, or fried with butter, what coming out of the frying pan will be crispy and tasty dish of scorpion that should not be miss. 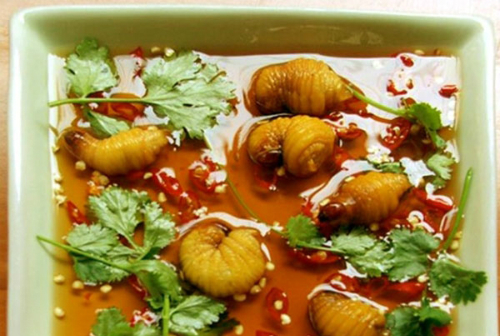 One of the best cuisine of Vinh Long province area, cicadas is favored by the locals because of their exceptionally fatness and softness. As a insect, cicada has its thick and hard coat to protect the vital parts of its body. But once in awhile, they have to molt, and that is the best time to catch them. Because of the molting period, their meat is revealed, which is very soft and rich. There are many ways to prepare the Vinh Long special cuisine. You can fried them with onions to enrich the flavor, deep fried or to porridge. In the hot and humid tropical weather, it is an ideal environment for many insects and reptiles to grow. 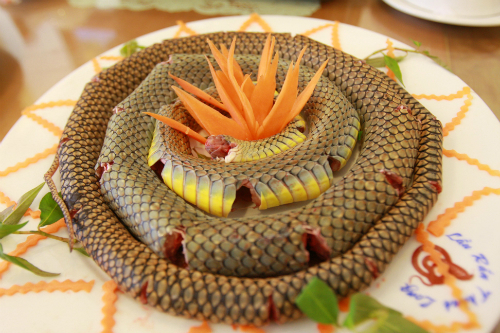 Snake is a very special rural cusine of the Mekong Delta area. Once you have tasted the tough but rich in flavors meat, you will never be able to forget it. Like the iguana, the main purpose of snakes in the old days was to soaked in the medicine alcohol. But nowadays, the needs for more flavors have created more ways to make this exotic dish. You can fried, grilled, stew. You can also choose to eat it fresh with vegetable, to make soup with eat. There are so many options for such exotic dish, but the flavors are unique. As the rain season approached in the central regions, you can see more and more larvas. 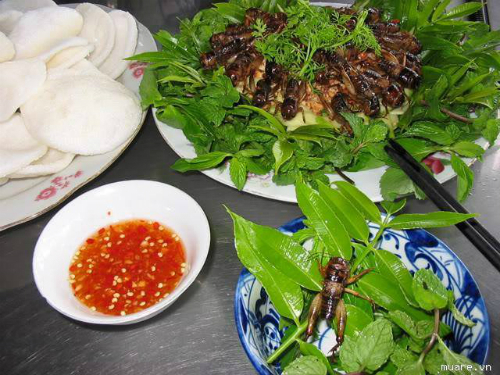 Like many other insects, the Thanh Hoa province cuisine has changed and become a part of the local daily’s meals. Riching in flavor, nutrient, and has a distinguish smell, larva is not only a exotic dish for you but also good for you health. The best place to find these meaty and crunchy crickets are Tra Vinh, An Giang, and Can Tho provinces, located in the southwest of area, closed to the Cambodia’s borders. While the dry season passed away, the rain season comes with so many crickets flushed into the grass and fields. Because of the great demands, many restaurants have decided to grow their own cricket. However, the best of them all is still the one been catched on the grass and on the field. Very similar to the rats in body figures, yet Dúi can only be found in the jungle of Central Mountains (Tây Nguyên), or Hòa Bình area of the Mường ethnic. Dúi can be cooked in many ways like stew, fried, or soaked in plum wine. You only need to try this exotic but unforgetable cuisine to fall in love with it.